Sift together flour, baking powder, soda, and spices. Wash and cut raisins. (Roll in a small amount of the flour mixture.) Cream shortening; add sugar gradually; then eggs, mixing thoroughly. Add flour mixture alternately with soup; stir until smooth. Fold in the raisins. Pour into two greased and floured 8-inch layer pans; bake in a moderate oven (375°F) about 35 minutes, or until done. 8 servings. Frost as desired. 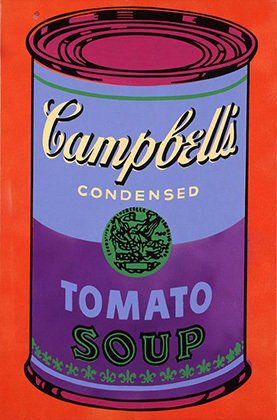 Image: Andy Warhol. Campbell's Soup, 1965. Milwaukee Art Museum, Gift of Mrs. Harry Lynde Bradley, M1977.157.